This summer, military families get free passes into over 50 fantastic Pacific Northwest museums. The Blue Star Museums initiative is a partnership among Blue Star Families, the National Endowment for the Arts, and more than 1,000 museums across America. Blue Star Museums offer free admission to active duty military personnel and their families from Memorial Day, May 30, 2011, through Labor Day, September 5, 2011. Read more at the Blue Star Museums page. A few of my favorite family museums: High Desert Museum (in Bend, Ore.), Portland Art Museum (Portland, Ore.), University of Oregon Museum of Natural and Cultural History (Eugene, Ore.), Kids Discovery Museum (Bainbridge Island, Wash.), KidsQuest Children’s Museum (Bellevue, Wash.), Leavenworth Nutcracker Museum (Leavenworth, Wash.), and the Burke Museum, Museum of Flight, Seattle Art Museum and Museum of History & Industry (Seattle). If you’re thinking of sun, sun and more sun (and who isn’t, at this point? ), you’ll probably find warm weather and bright days in Oregon. I’d like to offer this Oregon Family Road Trip for your consideration. We went on this 5-day getaway last year over Labor Day weekend (plus a few more days) and had a lovely time – although you could also do this over Memorial Day or during summer break. Drive from your starting point eastward toward Mt. Hood. Pull over at Bob’s Red Mill Whole Grain Store (right outside Portland, in Milwaukie). 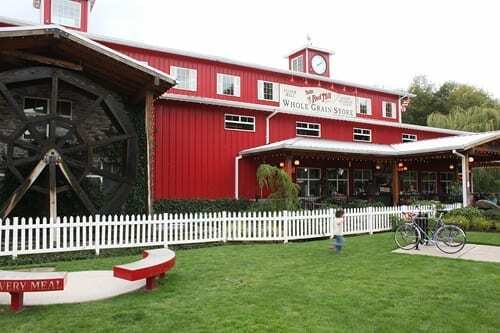 This grainy emporium features a giant waterwheel, real mill-grinding stones, great breakfast and lunch in the café and plenty of snacks for your Oregon road trip. I know it seems goofy to visit a store, but this store is pretty cool. Let kids pick a snack or two (gluten-free or not) from the bulk bins and enjoy a lunch, either from the second-story dining area or on the outdoor patio. Stop off at Mt. Hood’s village of Government Camp and visit the Mt. Hood Cultural Center and Museum (check out the teeny-tiny mountain-climbing boots belonging to an elementary-aged kid). Or enjoy the kid-friendly birdwatching, hiking, wildflower-photographing (no picking!) or mountain biking on Mt. Hood. Read more about summer activities at The Village at Government Camp site. Stay overnight at Timberline Lodge. Read more about our family accommodations at Timberline. Snow-covered mountain caps gradually fade into fir forest and grassy pasture, before flattening out into Central Oregon’s sun-kissed topography. Deep-green leafy trees cluster along riverbanks and wildflowers pop out of the most unexpected roadsides. For an optional stop between Mt. 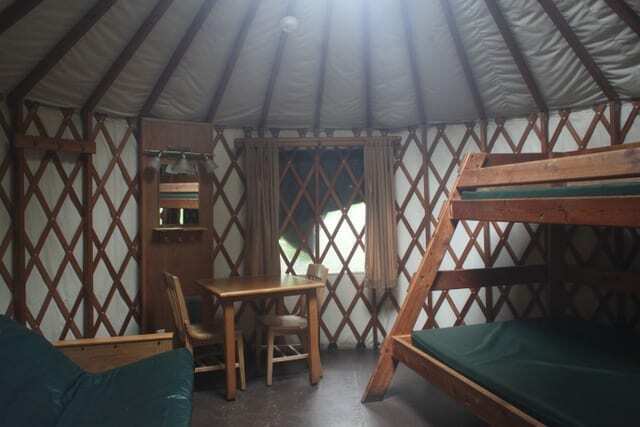 Hood and Bend, pull over at Kahneeta Resort & Casino and visit the museum’s traditionally designed encampment (read more about staying at Kahneeta at Milagros Boutique’s blog). Or you can pull out a gallon of sunblock and visit the always-hot Smith Rock State Park, where rock climbers scamper up the face like tiny lycra-clad spiders. Wade in Crooked River’s banks, and show kids “Monkey Face,” a 350-foot-tall rock formation that resembles a primate’s mug. Continue on until you reach the compact, turn-of-the-century-quaint town of Bend. Lunch at a family-friendly restaurant (our pick: The airy, spacious, healthy-but-delicious Deschutes Brewery). Coloring outside the lines at the Deschutes Brewery. 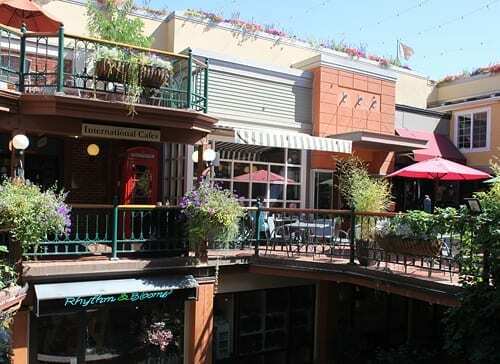 Then, stretch your legs on Bend’s streets: Children’s clothing stores, bookstores, toy shops and two candy and ice cream shops (Powell’s Sweet Shoppe and Goody’s Soda Fountain and Candy) pack the downtown grid. Pick up food at a grocery store before heading to your Bend condo or resort; the on-site food options are typically expensive and mediocre. My family gives eight thumbs up to the deli salads and quick-cook pizzas from the Bend Whole Foods. Most of these stores are clustered in Bend’s suburbs, along Highway 20. We stayed at the Sunriver Resort in one of the condominium vacation rentals. The kids loved Sunriver, and I have to say, the adults loved it too. Among the attractions: Three outdoor pools (and one indoor pool), a fascinating observatory and nature center (my kids and husband went on a four-star “family owl walk”), a kids’ camp (Ft. Funnigan) that runs through both day and evening, an arcade, bike paths that line the river and weave through pine forests and horseback riding. 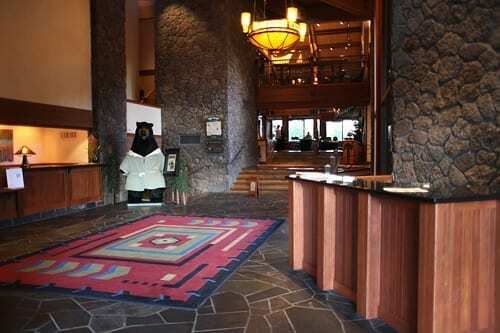 Sunriver Lodge’s front entry, where even the bears welcome you. Take a VERY close look at the condo vacation rentals before committing to your purchase. Each rental is decorated and maintained at different standards. Our first rental was unacceptable to me (sort of mildew-smelling, mold in bathroom, oven will burn kids) and I asked to move to a different property. The second property was immensely better. Also, familiarize yourself with the Sunriver map. If you think you’ll mostly be hanging out in your room, biking the trails or out in the surrounding area, it’s fine to be located further from the main lodge area. But if you have young children that tire easily or you want to be able to access the pools, try to stay near the Lodge area (lodge guestrooms, rentals in the Tennis Village Condo areas). The new, upscale Caldera Springs area is incredible, if your budget can afford the expense or if you’re sharing the cost with another family. The amazing outdoor swimming area at Caldera Springs. Bring your bikes or shop around on-site for the best bike rental prices, and do not neglect to check out prices in the Sunriver Village Mall. Prices (per day or multi-day) vary tremendously, and you’ll kick yourself if you pay far more than you should. Check the Sunriver vacation packages and deals page. Accommodations aren’t cheap, but they’re worth it. Really, they are. I like this property far better than I like Washington’s Suncadia (sorry, Suncadia). On the resort’s website, you can sign up to be included in deal e-mails. Do I need to add that my kids are now nagging me to death to return to Sunriver Resort? No, I do not. Endlessly. They. Nag. Lava once scoured and scorched this area of earth. But that lava now provides you with an always-chilly escape into the earth’s basement. Pack a sweater and jeans, sturdy shoes and a flashlight (One flashlight for EACH MEMBER of the family. 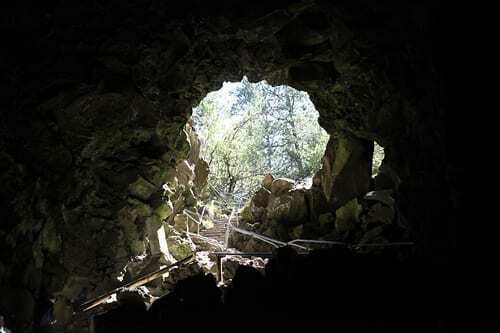 I am not kidding about this) Then head into the dank, dark lava caves at Newberry National Volcanic Monument. It is pitch-black once you get deep inside and you cannot even see your hand in front of your face; see, aren’t you glad you brought so many flashlights? Not a place for young children terrified of the dark, but a great exploratory experience for big kids and their fraidy-cave parents. Lamps can be rented at the monument, but it’s better to just bring your own. The High Desert Museum is incredible. 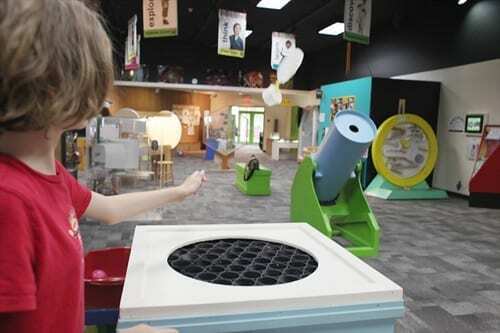 A toddler- and preschooler-friendly play area entertains little ones, while the Volcano Country exhibit handily beats boring school geology discussions. You’ll also learn about local flora and fauna and Central Oregon’s wild history in a glossy, contemporary building. Outdoors, a heavily shaded area shelters a working replica of a lumber camp; on high-traffic days, you’ll even see period-dressed men recreating the planing of timber. 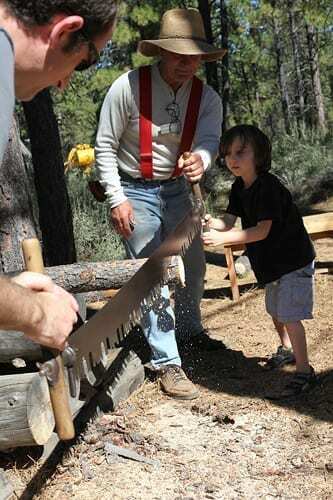 Even kids can help saw wood at High Desert Museum. A top-notch historical museum with a calendar full of family activities. Today, you return to Oregon’s western through a gorgeous evergreen route. Before hitting the road, eat breakfast at Alpenglow Cafe, which serves up real maple syrup alongside generous portions of homestyle pancakes, homemade breads and locally-smoked meats. Oregon family-friendly and Oregon farm-friendly can’t be beat. Of course, there are plenty of vegetarian options as well (this is the Pacific Northwest, after all) — you can even sub in tofu for those farm eggs. In my opinion, the best way to go from Eugene to Bend is to take the 2.5 hour, two-lane Highway 26 route, which pulls you through the western-style town of Sisters, Ore., before shooting you over the mountains. You’ll enjoy ear-popping mountaintop panoramas before descending into Western Oregon’s verdant firs and deciduous trees. Now that you’re in Eugene around midday, what will you do? 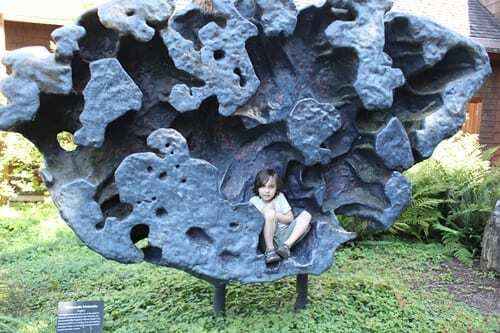 Check out this family guide for 15 fun things to do with kids in Eugene, Oregon. Sniff! Are you sad about going home yet? I loved writing this trip report up and can’t wait to repeat this trip. Does your family have a favorite Oregon road trip itinerary? Eugene offers multiple options to keep your family entertained and well-fed. For this piece, I visited Eugene, and I also consulted with Melanie Willson, a Vancouver Island mom that lived in Eugene for several of the past few years; she still visits regularly. I trust Melanie’s opinions and found her Eugene-with-kids suggestions wonderful and spot-on accurate. I hope you find them equally useful. Ride a six-foot wave at Splash! At Lively Park in Eugene’s neighboring city of Springfield, about 20 minutes from downtown Eugene. This swim center is a lap above similar community pools; there’s a baby pool, a corkscrew slide, hot tubs – and oh yeah – that crazy, deep wave pool that tosses swimmers around like driftwood. In a fun way, of course. This is one of my favorite pools in the Pacific Northwest. Once you’re done playing in the pool, a giant climbing playground waits outside for a second round of fun (as in, yes, you should bring lunch/snacks – you’ll be here a while). My favorite Eugene experience? 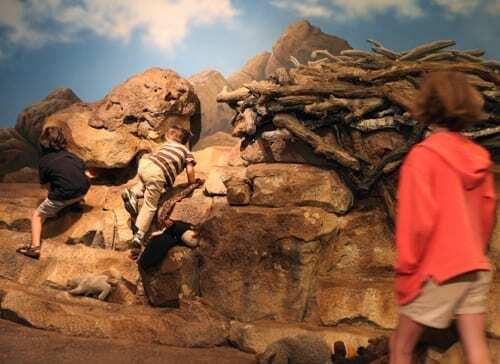 The University of Oregon’s Museum of Natural and Cultural History, where kids can consider ancient traditional slippers and examine dioramas of traditional Native American life. Then, inquisitive kids give archeology a hand in the “Think Like a Scientist” lab, where they can use a magnifying glass to unravel bone and fossil mysteries or wonder at the evolution of a horse’s hoof. At the U of O, learning about the Oregon Coast (and a great stop pre-Coast). 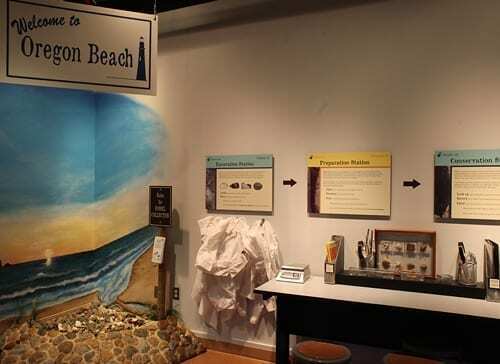 The compact, child-friendly area of the museum is clean, new, and stocked with interesting artifacts and hands-on options that make history and science come alive. 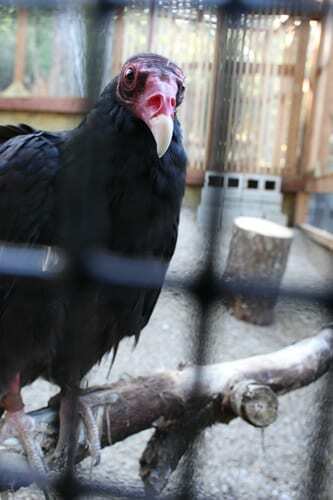 Spy an eagle or falcon at the evergreen-sheltered Cascades Raptor Center, where over 60 resident birds represent 33 species in outdoor cages. Each bird’s short story is right next to their cage, so you can discover more about each raptor – or maybe even “adopt” one. Wear sturdy shoes, as the ground is uneven. 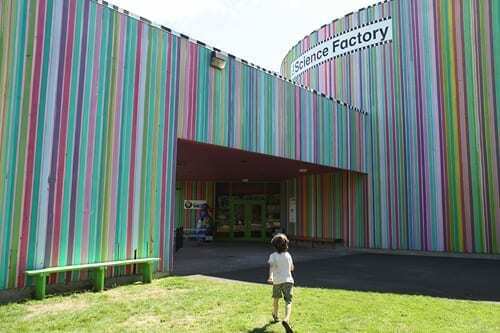 Play for an hour or two at the Science Factory Children’s Museum & Exploration Dome, the petite, well-loved cousin of science museums. You won’t find the multi-story experiences offered in the big cities, but it’s a fine way to spend an half-hour or so, and admission is only $4/person. Check the website for the current exhibit; when we were there, the museum focused on balls and ramps. 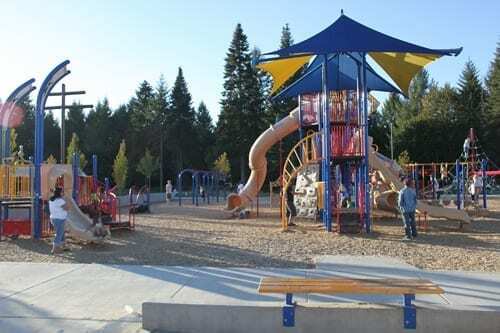 Run it off at RiverPlay Discovery Playground, where kids can uncover fossils in sand dig, climb a 25-foot replica of Skinner Butte or make a dam of sand and water in a replica Willamette River. Hike the 209-acre Mt. Pigsah Arboretum with your family – and bring the camera for photo-ready moments along wildflower meadows and in Evergreen forests. Check the website before you go and see if there’s a guided family walk on the calendar – then sign up for an educational ramble through the woods. If you’re going to visit a toystore in Eugene for travel-ready playthings, The Elephant’s Trunk should be your destination. Located in downtown Eugene, this shop crams hundreds of toy options into a tidy, well-organized store. Dolls, animals, toddler toys and more. The store’s nestled in the adorable, flower-strewn shopping center 5th Street Public Market. Dig into Thai at Ring of Fire, located in an unassuming strip mall. Ask for a seat in the back room, where your family can sit under giant umbrellas. This is a good option with adventurous, older children. Pluck a pie or pick up a tart at Sweet Life Patisserie. This patisserie takes its sugar seriously, with dozens upon dozens of cakes, pies, cupcakes, cheesecakes, tarts and tiny delectable chocolates, all laid out in several glass cases (try to refrain from licking the cases, it’s just not becoming of a mom). An amazing selection – even Eugene’s vegans are catered to — and it’s hard to go home with just one dessert. Get in touch with your inner tofu-yoga queen at Morning Glory Café. Yes, this is crunchy hippie food (you will find tempeh and sprouts) but there’s lots of food (split plates!) and those scrambles taste good. This café sits within a stone’s throw of the railroad terminal, so toddlers will have something to watch for, while you’re watching for breakfast’s arrival. A good option for those sensitive to wheat, dairy and other issues. “Don’t overlook their amazing tea blends,” Melanie says. How about Laughing Planet? Melanie made up a song to entertain toddlers en route to the popular stop: To the tune of Frere Jacques: Laughing Planet, Laughing Planet/ Where are You? Where are you? / I want a burrito, I want a burrito/ And some soup, And some soup. “The soup of the day is generally delicious and the Che Burrito (Plantain, black bean and sweet potato) is not to be missed,” she says. Thanks, Melanie! Readers, do you have any kid-friendly Eugene suggestions? For more information on the Eugene area, consult with Travel Lane County. I loved e-mailing back and forth with the knowledgeable Paul Gerald, author of 60 Hikes Within 60 Miles of Portland. After I looked over his bio a little more, I discovered that he’d also written Best Tent Camping in Oregon (you can order both books from Paul Gerald’s site). So it was obviously time to ask Paul about family-friendly campsites in Oregon! 1. What’s the best thing about camping in Oregon? Why do you love it? I love it because I love being outdoors: hearing the birds first thing in the morning, sleeping to the sound of a stream, seeing the stars, and being away from electronics and cars. And Oregon is easy to love because of the variety. Within a few hours of Portland we can sleep on the beach, in old-growth forests, way up in the mountains, in a desert, by a trout-filled stream, or a deep blue lake. 2. Can you recommend a great kid-friendly campground along the Oregon Coast? Cape Lookout State Park has it all: yurts, ranger programs, a fine beach, some easy and scenic hiking trails, showers … and it’s even close enough to Tillamook that you can head into town if you want. Location: 90 minutes west of Portland. 3. 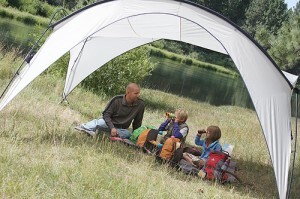 Can you recommend a great kid-friendly campground in a forested area? I think Lost Lake Resort & Campground can be a great place for family camping. It’s a paved road all the way there, and the lake is beautiful, with an amazing view of Mount Hood. It’s a Forest Service “resort,” which just means it has a store and boat rentals, and the lake is stocked with fish. There’s even a quiet, walk-in tent camping area near the Old Growth Interpretive Trail, and another trail that goes all the way around the lake. Location: About two hours east of Portland, Oregon. 4. How about a family campsite in Central or Eastern Oregon? Anything near Bend? Try Tumalo State Park. 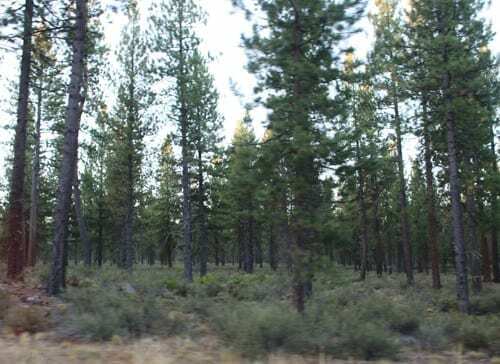 It’s right on the edge of Bend, and it has both yurts and camping, but it’s also a quiet retreat along the Deschutes River, and close to everything Central Oregon has to offer: access to the Three Sisters, the desert, lava beds, and Newberry Crater. Location: About 15 minutes north of downtown Bend. 5. Are there any other Oregon campgrounds that stand out as being particularly family-friendly? For quiet, low-tech camping, I really like Riverside along the Clackamas River. A lot of the campsites along the Clackamas get busy and crowded, but Riverside is an exception. It’s only got 16 spots, and you can’t get a big RV in there. And it’s right on the river, with an easy hiking trail leaving from one end of the camp. Location: About an hour east from Portland, Oregon. Find more great information about traveling in Oregon from Travel Oregon. Recently, Seattle dad Greg Bamford, wife Shannon and their two daughters Clara (4) and Annabel (18 months) went for three nights and four days to Rockaway Beach, Oregon a little under two hours from Portland. They also popped into Bend, Oregon for a brief visit. Let’s read about their journey. 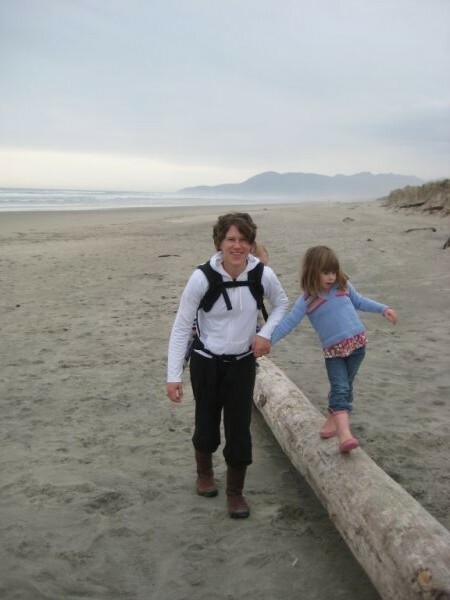 What did you do in Rockaway Beach, Oregon with kids? We stayed at a family cabin at Rockaway Beach in Tillamook County. It’s right on the beach…very quiet, smells great, lots of walks and digging in the sand. Really not much of anything to do in town. They mainly love playing in the sand. Digging and getting dirty. And reading in front of the fire. Playing board games. Shannon and kids on the beach. So I highly recommend having a family member who owns a beach house, ha. I’ve been going there since I was Clara’s age. Where did you eat at the Oregon Coast with kids? We mainly cooked. The Oregon Coast is not much of a dining mecca, in my mind, although there are good pizza places and such. So we ate the local stuff: Tillamook Ice Cream, of course. And I ordered Dungeness crabs and steamer clams off the boat. There’s a place between Rockaway and Wheeler where the boats come in – The Jetty Fishery. The employees steam the clams for you, then gut the crabs. They always try to get me to eat the crab heart. That’s the best meal of the trip, always. Did you stop anywhere cool, while en route to the Oregon Coast? Kids love the Tillamook Cheese factory. Because there’s ice cream. And it’s kind of interesting to think about all the milk they consume. There’s also an AWESOME public aquatic center in Astoria, about a 1.25 hours north of Rockaway on the way back to Seattle. For $12 the whole family swam and had waterslide access, showers, family changing room, kiddie pool, baby pool, hot tub. This was a great stopover for a long ride back. We paired it with pints and lunch at Fort George Brewery and Public House in Astoria. They had a great kids menu as well as great IPA. Next time, I’ll do the same but stop at the Rogue Brewpub, which is right on the Columbia River. We chose not to go back through Portland, but I regret it, because Apizza Scholls is amazing pizza. Ohmygawd. It reminds me exactly of Grimaldi’s in Brooklyn. The secret (as with all artisan pizza) is in the crust. Actually, Apizza’s pizza is maybe better than Grimaldi’s, but very much of that type. There’s nothing like it in Seattle. You also went to Bend, Oregon recently. What did you think of Bend with kids? Bend is awesome. We are looking at relocating there, hence the trip. It’s quite inexpensive housing-wise right now. The big discovery there for kids was the Juniper Swim & Fitness Center facility. It has several pools – inside and out – a kid pool, a waterpark outside, and kids exercise classes – there was a kids yoga class when I was there – so cute! And cheap. Oh, and child care for when you work out/swim. Everything else is pretty obvious – hiking, biking, skiing, et al. 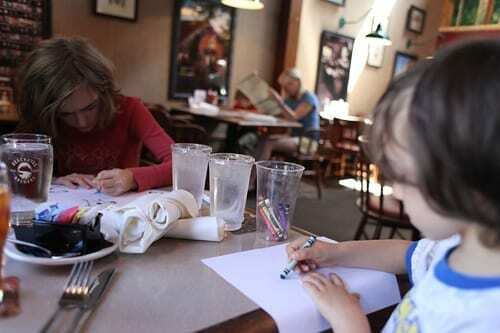 Did you find any great kid-friendly restaurants in Bend? Yes, the kid’s menu at Deschutes Brewpub. The food is exactly the same as the adult menu, but cheap. Clara had an insane, grassfed, all natural, huge hamburger with a side (we chose applesauce, but it could be chips or fries) for $5 flat. It’s leftoverlicious, exactly the thing for a hungry dad. Last time, she got an amazing salmon fillet for $5. It was the best thing at a table with five people. At the same time, you can enjoy fine brews as an adult. Did you know there are six breweries with restaurants in Bend? Thanks, Greg. And if you don’t want to go to Bend for Deschutes, there’s also a Portland Deschutes location. Read more about the Oregon Coast via the Oregon Coast Visitors Association. Have you been around the Bend? Bend, Oregon’s warm, dry air is the perfect prescription for rain-inflicted doldrums. As a kid, I loved going to Bend and rubbing scented sagebrush between my fingers, riding bikes along flat (flat! really!) paths and hiking the twisted trails by the Deschutes River. So why don’t we ask a local family for their favorite Bend locales? Bend resident Sarah Laufer and husband Justin met while they were both guiding whitewater rafting trips in Colorado. They soon moved to Bend, where they’ve been raising their two kids, 5-year-old daughter Chloe and 3-year-old son Avery. Sarah’s also the co-founder of PlayOutdoors.com, an online store specializing in children’s adventure gear and clothing. This mom knows her great outdoors. Here are Sarah’s tips on where to eat and play in Bend, Oregon. 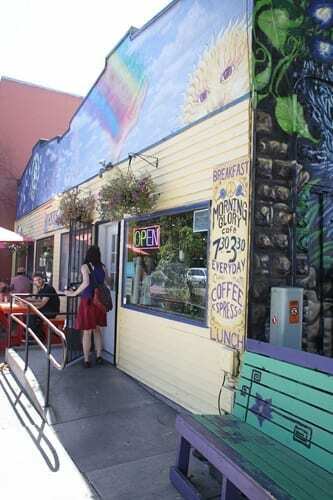 Where does your family like to go for breakfast, lunch and dinner in Bend? Which Bend restaurants are kid-friendly? Breakfast: Go to Cafe Sintra. Manuel, the owner, loves kids and the food is so yummy and family friendly. It’s breakfast with a Portuguese twist. Lunch: Go to Croutons, which offers yummy sandwiches and salads, along with special kids meals. Locally owned, totally affordable and with great outdoor seating. Dinner: Pastini in the Old Mill right near the river trail. What kiddo doesn’t like pasta?! There is awesome outdoor seating and food is yummy and comes out lickity split! Want Mexican instead? Try La Rosa in Northwest Crossing. If you knew of family friends coming into town with kids, where would you take them? What are some things to do in Bend with kids? In the winter, we would head up to the Wanoga Snow Play Area with some treats and a thermos of hot cocoa for some sledding and cross-country skiing. There is even a warming hut with a wood stove and plenty of wood to get cozy and take a break for the next round of romping in the snow. Don’t forget your Sno-Park Permit. In the summer, we would probably head to Shevlin Park for a picnic, rock skipping in the river and a nice walk/hike. Also fun to bring bikes and go for a ride on the pavement or trail. there is actually a dirt road that goes all the way to Sunriver Resort, if you’re up for it. Drake Park is a great place to take a walk around Mirror Pond. The park also hosts summertime concerts (Munch and Music) and the Bend Farmers Market. It’s right near downtown. Drake Park with kids. Photo courtesy of Play Outdoors. But there’s just so much to do outside in Bend year round! In the spring, you can float the Deschutes River, ski Mt. Bachelor, go for a bike ride, and head out for a walk on the Deschutes River Trail all in one day. That makes for very happy — and tired — kidlets. And in bad weather? What would you do in the rain with kids in Bend? The High Desert Museum is by far the best museum in Central Oregon! They have great kids programs along with current exhibits all about the plant and animals in the high desert. For more family-friendly ideas on what to do on your Bend vacation with kids, see the Visit Bend’s Family Fun Page. Or order The Children’s Travel Guide to Bend, Oregon by Crystal McCage. For more kid-friendly restaurants, read Top 5 Family Friendly Restaurants in Bend, Oregon, an article in True North, a parenting magazine for Central Oregon families. Browse True North’s calendar to discover timely activities and events. And read this highly opinionated (and hilarious) piece from Bend Oregon Restaurants, “Family Friendly Restaurants” — with notes on where to have a not-too-annoying kid birthday party when you’re in town. 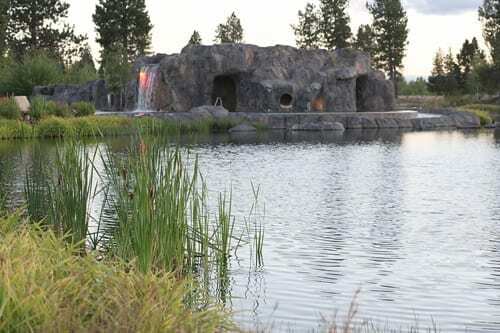 Which kid-friendly restaurants, activities, shops and hotels do you recommend in Bend, Oregon?